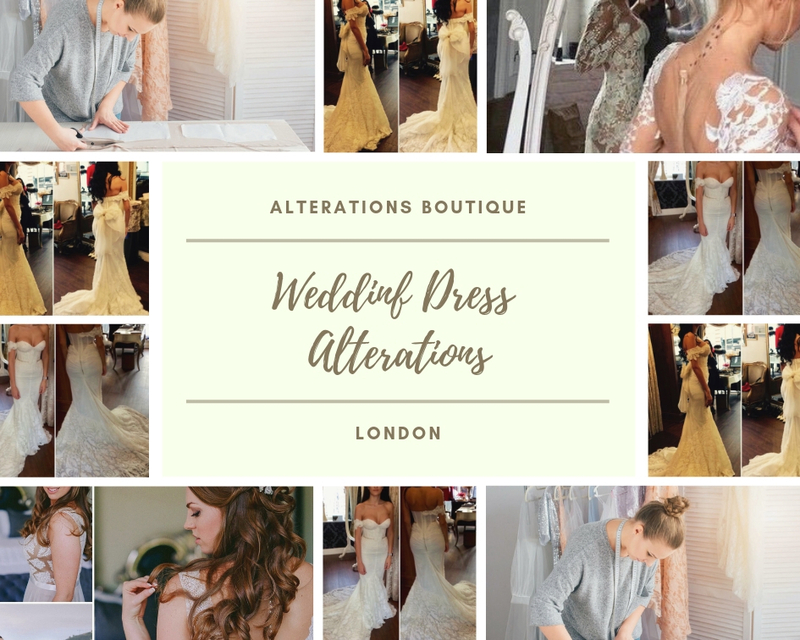 Established in 1983, Alterations Boutique has become one of the leading specialists in Wedding Dress Alterations and Restyling in London, offering more than 30 years of experience combined with excellent customer service. Is your bridal dress plain, has intricate lace, beads or any other type of embellishment? Our bridal alterations experts have the experience to performany type of bridal dress alterations whether your dress requires simple tweaks or complete restyling. At Alterations Boutique we offer a full range of wedding dress alterations, including neckline restyling, train alterations and adding bespoke embellishment. Our highly experienced wedding dress seamstresses will understand your needs and requirements noting down every single detail to ensure that your vision is transformed into reality. Whether you have purchased your bridal gown from a department store, a bridal boutique, inherited it or have decided to wear a vintage wedding dress and need it restyled, resized or remodelled, we can help. At Alterations Boutique, we are renowned for providing award-winning customer service that we believe every single bride deserves. We want to make sure all brides-to-be feel truly special, by sculptung a bridal dress that fits, looks, and feels perfect yet comfortable. Whether you have already decided how you would like your wedding dress to fit or need some help from our talented bridal seamstresses, we will work on your gown until it’s impeccable. In our experience, most purchased wedding dresses require alterations, as there is no such thing as a standard body shape. If your wedding dress needs to be altered in any way, it’s important to have a plan in place in advance. How early you need to bring the dress to us would depend on the complexity of the bridal dress alterations required. To ensure that we have time to achieve the perfect result you desire, we recommend bringing your wedding gown in no later than three months before your big day. This gives us the chance to get all of the work required done on your dress, as well as time to have several fittings to ensure you are happy with your gown and that your dress is exceptional in time for your wedding day. Your final fitting should be close to the wedding to ensure everything, including the fit, is perfect. We would recommend that you bring your bridal dress to us at your earliest convenience, remembering to bring the shoes and underwear you intend to wear on the big day. During your first appointment, our bridal seamstress will understand your vision, pin your wedding gown and give you a breakdown of costs. If you are happy to proceed we will schedule a date for your first fitting. We will store your dress until then so you won't have to transport it to us again. We believe in charging our customers fair and reasonable prices, therefore, we undertake regular research to ensure our rates are moderate. All fittings including the initial consultation are free. We would agree the wedding dress alterations cost with you prior to starting any work. For example, if we reduce the size of your wedding gown and it still does not fit correctly when you try it on, we would not charge you again for working on the same area. There are many different ways of creating a christening gown but it has increasingly become fashionable to create a baby’s christening gown by incorporating parts of your wedding dress. Your bridal dress is sentimental to you and therefore it is the perfect choice to use it to create another special outfit for another special family day. For example, if your bridal gown has a train, we can use it to design a beautiful christening gown for your baby. This does not mean the end of your dress as we can use it to create a matching tea length dress you can wear at the christening ceremony. Otherwise, we can work with you to design a christening gown using all the fabric and trims from your wedding dress. Whether you will decide to create a mini replica of your own wedding dress or would like us to come up with a completely new design, or have already designed it yourself, let our dressmakers work with you to create a unique and special outfit for you and your baby. Your wedding day doesn’t have to mean the end of your bridal dress. Let our talented dressmakers turn your dress into something new, better, modern and exciting. At Alterations Boutique we have the expertise to convert your bridal gown into a special outfit you can wear regularly. Let one of our dressmakers create a beautiful cocktail gown, an elegant blouse or remake the bottom part of your dress into a stunning skirt. Whatever piece you choose, it will remind you of the memories of your special day. Our talented dressmakers will work with you to create a unique piece that will always have a special and personal meaning. A Bridal Baby Bump: A Pregnant Brides Guide To Dress Alterations! Wedding Dress Alterations FAQs: Your Questions Answered! Ruby Hammer, British internationally acclaimed fashion and beauty makeup artist, columnist, co-founder of Ruby & Millie, and co-founder and Director of Scarlett & Crimson cosmetics brand, invited Alterations Boutique to make her a wedding dress and a dress for her daughter Reena Hammer. 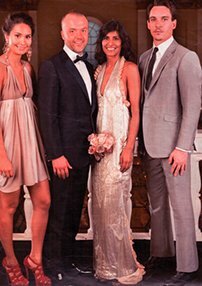 Maria Blazquez, founder of Alterations Boutique, creating the bridal dress which featured in Hello Magazine. 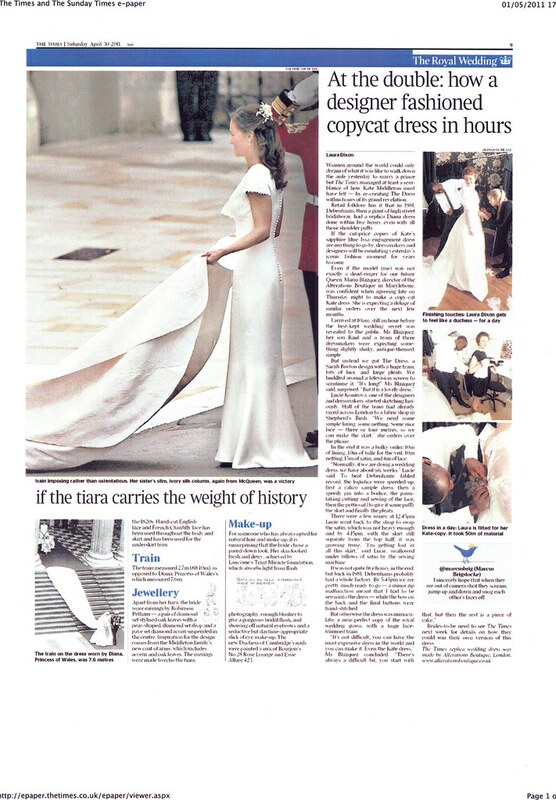 Alterations Boutique made the first replica of Kate Middleton's Wedding dress as commissioned by the Times in 5 hours! 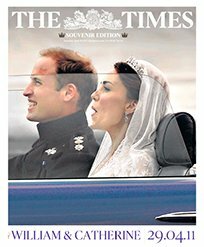 Watch Maria Blazquez, the founder of Alterations Boutique, being interviewed on Sky News (CLICK ON LINK BELOW) and David Emanuel the designer of Diana's (Princess of Wales) wedding dress, praising our bridal dress on ITV's Lorraine show on 02.05.11 (CLICK ON LINK BELOW). You can click on the link below to the Times article 30.04.11 to read the full story.